Intel Inc has successfully launched its Atom processor, the famous ultra small form factor and low power processor for UMPC (Ultra Mobile PC), MID (Mobile Internet Device) and embedded markets. This has created huge momentum especially for board vendors to develop some new platforms targeted for different market segments and solution integrations. Analysts even predicted that the over demand has caused silicon shortage among all the interested parties. In view of this huge market demand and opportunities, AMD (Advanced Micro Device) has announced its plan to come out with an Atom’s rivaling chip to compete in this low power but yet powerful market segments. 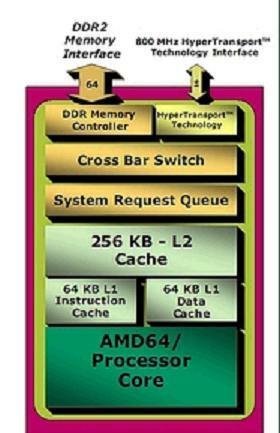 Codenamed as Bobcat, the AMD next generation processor will be available in 1GHz core speed, backup with 64kB for both L1 Instruction Cache and Data Cache as well as 256kB L2 Cache. It comes with 2-chips solution which includes the Northbridge with integrated memory controller that supports DDR2 running up to 800MHz. All these contribute to higher TDP (Thermal Dissipation Power), the 2-chips is expected to hit 8W TDP which is quite high as compared to Intel Atom pairing with SCH US15W chipset. As compared to Intel Atom that has so much of advantages in terms of architecture and feature sets, apparently AMD may need some other advantages in order to attract the existing board vendors to switch to Bobcat. The only advantage that we can foresee could be in terms of lower pricing that AMD may offer in order to survive in this arena. More information will be available in November this year.